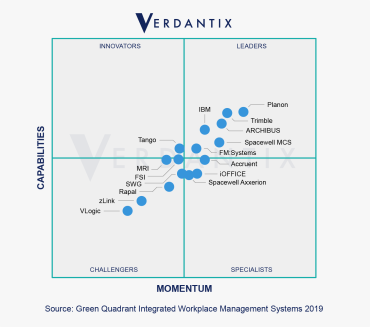 Planon has again been recognized as a leading solution provider in the global IWMS software market by being named a “Leader” in the Verdantix 2019 Green Quadrant Integrated Workplace Management Systems (IWMS) report. Planon is a market-leading vendor of innovative software that supports corporate real estate, facility managers and service providers in optimizing their business and workplace performance. One reason for Planon’s success in this market is a continued focus on market research, customer collaboration and technology partnerships. For example, Planon is currently conducting research into the role of artificial intelligence in optimizing operations for FM service providers. In compiling the Green Quadrant, Verdantix looks at strategic success metrics including vision and strategy, installed customer base; organizational and financial resources. The Green Quadrant also assesses capabilities like IT systems integration, business intelligence, user interface, mobile apps, configurability and enterprise reporting.